There is certainly no shortage of talented people flocking to Silicon Valley for job opportunities. However, in recent years, the Bay Area has also begun to experience an uncharacteristic exodus. Among these migrants, you’ll find numerous individuals seeking to start fresh in the Midwest. Some are calling it home for the first time, while others are “boomeranging” back to the region that raised them. Millennials, in particular, are not only being lured to our region from the west coast, but from across the U.S. as well. In fact, a 2016 study by the Cleveland Foundation shows that Cleveland ranked eighth nationally for its growth rate of college-educated millennial residents, with the majority of migrants coming from Chicago, Pittsburgh, Las Vegas, Detroit and Brooklyn. The exorbitant cost of living in many of these locations is a primary factor driving individuals to seek opportunity elsewhere. But migrants to the Midwest, and more specifically Cleveland, are also increasingly drawn to the prospect of being an integral part of community revitalization— whether it’s happening in a burgeoning tech town, or their own former hometown. 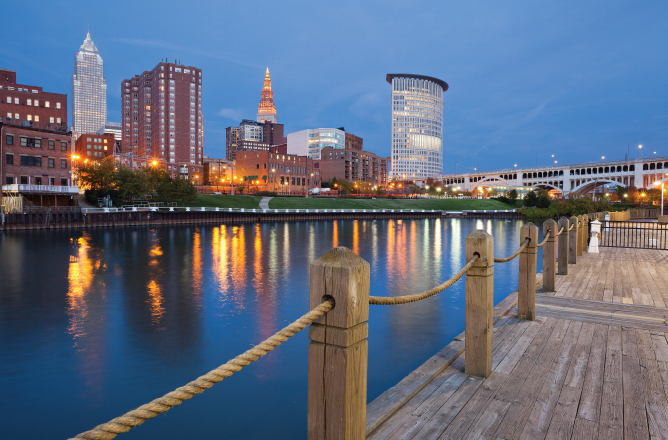 The rise of Northeast Ohio’s tech scene, our strong entrepreneurial community and the growth of established industries such as insurance, banking, healthcare retail and manufacturing makes our region a prime location for those looking to boomerang back to the Midwest. In 2016, Cleveland State released results from a two-year long study of job growth. The results showed Cleveland’s job growth from 2014-2015 represented a near 20-year high and was the fourth highest gain in the nation. As more people are attracted to Cleveland, word is spreading about our region’s growing number of job opportunities—including jobs in tech-based career paths. As a result, it’s not just established professionals migrating back to the Midwest. College students who left to study along the coasts are giving serious thought to “boomeranging” back home after graduation to seize opportunities right here in Northeast Ohio. It’s not much of a surprise that Cleveland’s cost of living is far lower than that of tech hotspots around the country, a factor that has significantly contributed to the city’s consistent 95+% residential occupancy rate and ever-expanding housing development. What may be surprising is just how much lower these figures are. According to NerdWallet’s calculator, the cost-of-living averages 33 percent less in Cleveland than it does in Boston, 44 percent less than San Francisco and 57 percent less than Manhattan. Jobs in these cities often pay higher wages, but when you factor in the above-mentioned cost of living, it’s often a net-gain for employees, giving regions like Northeast Ohio a distinct quality of life advantage for many people. Look around town and you’ll see that Cleveland boasts one of the most exciting, vibrant and diverse cultures of any city in the Midwest. The Cleveland Orchestra is consistently ranked among the best orchestras in the world, the Cleveland Museum of Art was ranked second best museum in the U.S. by Business Insider and in 2016, TIME placed Cleveland seventh on the list of America’s Best Food Cities. Not to mention, the Playhouse Square theater district is the largest performing arts center in the U.S. outside of New York. Meanwhile, other Northeast Ohio hubs like Akron have also built reputations as growing hotbeds of local art, music and food/drink. Akron is also home to Ohio’s only national park, Cuyahoga Valley National Park and becomes home to some of the best golfers in the world during the Bridgestone Invitational Tournament at Firestone Country Club. So, whether you’re thinking of moving to the Midwest, or you’re already here, visit the JumpStart job board to browse more than more than 70 open positions with entrepreneurial-minded companies in various fields all across Northeast Ohio.